SugarSmile: Please Vote for Us at Araneta Center's Dress Me Up Contest! 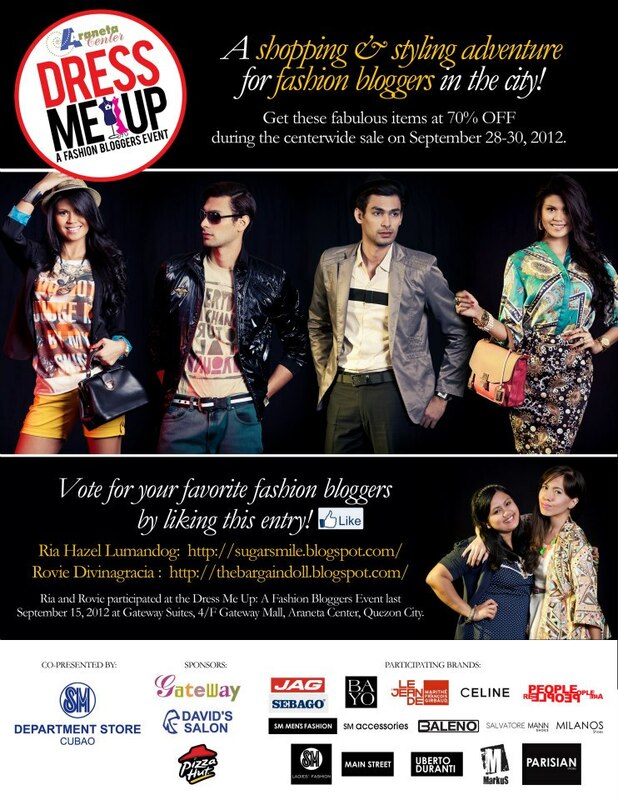 Please Vote for Us at Araneta Center's Dress Me Up Contest! The days unfold so fast and its the end of September in a few days already. And do you know what's best about the weekend? Its going places where you can find great sales and discounts. Lucky for us, Araneta Center got that covered, and the best part is, you can participate in so many activities they they have to offer. Last September 15, Rovie and I, together with 8 more fashion bloggers had the chance to become stylists for a day for the “Dress Me Up: A Fashion Bloggers Event.” Mind you, it wasn't that easy because we shopped at selected Gateway Mall shops and pulled out clothes from participating brands at SM Department Store Araneta Center. The clothes are modeled by Miss Universe Philippines 2012 Janine Tugonon, Bb. Pilipinas-International Nicole Schmitz, Bb. Pilipinas-Tourism Katrina Dimaranan, Bb. Pilipinas 2012 2nd Runner-up Annalie Forbes, and Miss International 2011 Semi-Finalist Dianne Necio, and male models from Next Models. Lucky for our team, we got paired with Katrina and Sassan, our best models ever! They had fun during the shoot, they were very professional and we got along very well. After pulling out clothes, we styled them a casual and corporate look, followed by a fashion shoot held at Gateway Suites and Pizza Hut Bistro, Gateway Mall branch. 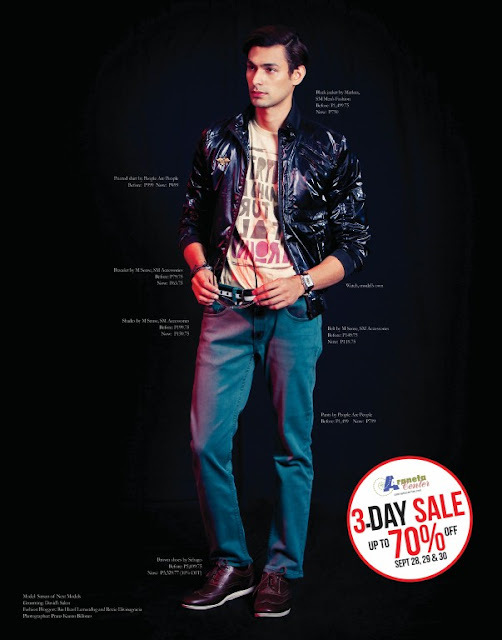 During the 3-day sale, the pictures will be featured in Gateway Mall and SM Araneta Center. And if we are friends in Facebook, I would have probably messaged you already about this, because you can vote for our entry at their Facebook Page at www.facebook.com/AranetaCenter. Score your favorite fashion picks during the centerwide 3-DAY SALE on September 28, 29, 30. “Dress Me Up: A Fashion Bloggers Event” is brought to you by the Araneta Center, co-presented by SM Department Store Araneta Center, and sponsored by Gateway Mall, David’s Salon, and Pizza Hut. Participating brands include Jag, Bayo, Marithé + François Girbaud, Celine, People Are People, Sebago, SM Men’s Fashion, SM Accessories, Baleno, Salvatore Mann, Markus, Milanos, SM Ladies’ Fashion, Main Street, Uberto Duranti, Markus, and Parisian. And if you haven't voted for us yet, please click the link below and LIKE our photo. It would really mean so much to us! :) Thank you!